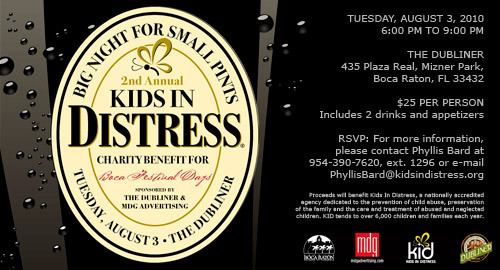 Come raise your glass and have a blast at a “Big Night For Small Pints,” the 2nd Annual Kids In Distress Charity Benefit for Boca Festival Days, sponsored by Kids In Distress, The Dubliner and MDG Advertising. This fun-filled event will be held on Tuesday, August 3rd from 6:00 p.m. to 9:00 p.m. at The Dubliner in Mizner Park. Enjoy live music by Taylor Road, along with good beer and good cheer as you support a very good cause for kids. Tickets are $25 per person, which includes two drinks, appetizers and a night filled to the brim with fun. Proceeds benefit Kids In Distress, a nationally accredited agency dedicated to the prevention of child abuse, preservation of the family and the care and treatment of abused and neglected children. KID tends to over 6,000 children and families each year. For more information, please contact Phyllis Bard at 954-390-7620, ext. 1296 or email PhyllisBard@kidsindistress.org.